KK: There was no decision made, really. It just happened. When I was a kid - don't ask me what age, I have no idea - I started writing short stories. I was and still am an avid reader, so this was just another way to get deeper into that world. Those stories weren't good, but my folks loved 'em. I think it's a parental law that they're supposed to love whatever their kid does, though - as long as it's legal. So that was really all the motivation I needed: two people who liked what I did, I liked doing it, and I never stopped. KK: I get very inspired by Stephen King. The way he writes - his prose - is very unique. You're in his head and you forget you're reading. You feel like he's sat you down and is telling you a story. In some cases a very LONG story. That's what I gravitate toward: I don't like to feel like I'm working when I'm reading. There are, of course, writers who are the opposite of King (in writing style) that inspire me. H.P. Lovecraft is a prime example. His prose, like King's, is so very unique and is more like poetry; you really have to think when you're reading Lovecraft. Or at least I do. LPR: I see you've written not only short stories and a novel but also have written screen plays. Tell us a little about these writing experiences. Have you had anything published in the short story and screenplay genres? Could the readers get copies of these? KK: I've written short stories, but like I said earlier, when I was a kid. I hadn't written a short story until about a month ago when I was between drafts of my next novel. None of them have been published, but I'm working to get this new one, "The Boy Next Door," out there. And yes, I've written screenplays, gobs of 'em - they were most of what I wrote for about seven years. One, which was co-written with a friend of mine in college - Kyle Kline - was produced. It was a low-budget horror-comedy that I'll keep the name of to myself... but that won't stop anyone from looking it up on the IMDB. In hindsight, it could've been better. Another screenplay, "The Great Chicago Fire," is available for download on the Amazon Kindle and is - quite obviously - about the Great Chicago Fire of 1897. I think that would be an amazing movie - doesn't matter if I wrote it or not, I'd be first in line. LPR: Let's talk about your book Moonlight. Tell us a little of the story. KK: The story is strange in that I always feel it comes off so silly when I try to explain it to people. I'm not saying "Oh, it's great... but you have to read it to see just how great it is!" I'm saying I'm not all that good at explaining it. It starts out with a power outage where nothing works anymore - you know - watches, cars, lights - anything electrical. As people try to figure out just what it is that's going on, a man shows up who begins to really mess up the town. And this guy - call him what you will - is able to "control" most of the townsfolk, even after they die. So there's a big zombie element in there. The story ends up really being about hope - how the survivors of this thing can find hope when dead people are running around trying to kill them. That's what the title refers to, actually - it references a scene late in the book when our main character finds his own little slice of hope while starring at the moonlit grass outside. 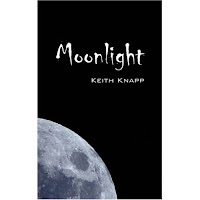 LPR: The blurb on your book says "In the tradition of Stephen King, Dean Koontz and Clive Barker, Keith Knapp tells a horrifying tale…" Can we assume these men inspired the writing of Moonlight? Are these your favorite authors? Have you tried other genres? KK: Yes, those are the top three guys I go to for "fun-reading." I know I mentioned H.P. Lovecraft earlier, but "Moonlight" isn't really Lovecraftian. 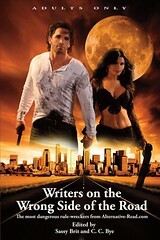 I've written in a bunch of other genres, especially in screenplays - those were mostly action and disaster pieces. Then "Moonlight" turned itself into a horror novel, and all of a sudden I was writing scary books. My short story and my next book are both in the horror genre - I think there's just a lot more you can get away with in a short story or novel than you can in a movie, horror-wise. KK: Why thank you. That means a lot to me. Character defines the story, I think. Even though I started out with the Big Idea (all the power goes out), that's all I had - it was the characters that made it into a full story, and thank God, it was the characters that figured out how to end it. There is a sequence where our main group of characters is trapped in a high school, and the real reason they're in there for so long is because I couldn't come up with a way to get them out. It was one of the characters that did that for me. As for the idea of a nameless man in a dark coat... that's kind of homage to Stephen King, who always uses a somewhat faceless entity when he's dealing with something of that nature. I tried to be a little different and give my guy his own story - you know, he's Pure Evil, the Devil, sure, but even the Devil has a story. But I think having him be nameless for the majority of it freed me (and him) up to do whatever we wanted. All the characters start out as a part of me. And to the end, there's some of me in all of them - different views, you might say. Through the course of writing, though, some characters break out on their own and become less like me and more like "them," and I always let them do whatever they want - they're the ones that know their lives best. However, the character of John Whitley is pretty much me from beginning to end. LPR: We've heard a brief description of Moonlight and how you came to choose your characters. Consider the novice writer and tell us a little about your writing processes. Do you follow a set schedule? How do you make writing mix with your daily living? Did you do a lot of research for Moonlight? KK: I can't do the whole writing from such-and-such an hour to such-and-such an hour - I tried it and it drove me nuts. What usually ends up happening is I'll write for an hour or so, then my brain will shut off. Just kind of go blank. So I'll answer some emails, watch some TV, take a nap (I'm a huge nap-taker so I'm living up to my name), then go back and write for another hour. So I guess that's my process: write for an hour, then take a nap. Mixing how I write with daily living, however, isn't easy. Yes, I still have a day job so that obviously cuts into a lot of writing time. But because of my process - needing a break every hour as it turns out - it makes having a normal social life a little difficult. I don't like to be very far from my computer. I think this could change should I ever be lucky enough to not need a day job, but for now it works - and my cats dig having me around all the time. I did a lot of research for "Moonlight." A lot of it was done in my childhood - it takes place in Westmont, where I grew up. I contacted city council members there and made sure I had my facts straight when dealing with the political characters. Stephen May, who's a council member in Westmont, was kind enough to not only answer all my questions regarding both politics and what Westmont is like now, but even went as far as to send me pictures of the town's power station - which as you've read is a big part of the book. But the high school is my old high school, where John lives is where I used to live, where people go in the novel are places I used to go. I had to use good old MapQuest to get everything right, though! But you might say I did most of my research as I was growing up. KK: I start out with a very vague outline: "The power goes out, then..." That was my outline for "Moonlight." Then I simply write as it comes, and the characters will usually tell me where to go. Sometimes they're way off, but no one's perfect. I'll usually re-write something 4-5 times before I let anyone else read it. That's not to correct all the mistakes (although there's always a lot of that), but simply molding things so that they make sense. I'll then have two or three close people I know read it and check for grammar, spelling, and my biggest fear: Things That Make No Sense. So some mistakes will slip through, but I won't hide the fact that "Moonlight" is self-published and honestly, when it came time to publish I was so excited and didn't have the extra money for a professional edit job. I think that was a mistake on my part, but we all learn from our mistakes. LPR: Do you ever face writer's block? If so, how do you get around it? Do you ever indulge in those little timed 10 minute writings that are called warm up exercises? KK: I haven't had writer's block yet. I think I may just write around it - like those folks in "Moonlight" who are trapped in the high school. I don't do any warm-ups or anything - I like to get right to it. LPR: Do you write 'to the market' or write the story you want to hoping to find a market after the work is done? KK: I write the story I want - or the characters want - to tell. I don't think about the market at all. KK: I think it was a case of over-excitement. I didn't think I'd be able to finish a WHOLE ENTIRE BOOK! I have an agent, but at the time I completed "Moonlight," she was out on leave and there's a whole story to go along with that that's either really interesting or incredibly boring. But she's shopping "Moonlight" around now to the bigger houses, and will be doing the same with my next novel - as long as I don't get over-excited again! I think she'd kill me if I did that. KK: I'm just finishing up a novel called "Coda," which is about what happens to a group of people right after they die. LPR: Suppose you taught a writing class. How about giving our newbie writers a couple of story starters? Don't have to be much. KK: I could go the easy route and use the first word from "Moonlight," (you know, the f-bomb) but that's a bit open ended. Anything could happen after that. Maybe something like: [Jack tossed the shovel in the ground and marveled over the recently dug grave.] There, that seems nice and happy.